They say that you can’t make an omelette without breaking some eggs, so at least we should all know how to start! A good omelette is a delicious kitchen standby – other than eggs, you really don’t need any particular ingredients, although a dash of milk and some butter are a good idea. An omelette is also a great way to use up leftover ingredients or those random ingredients that are lurking in the back of the fridge or kitchen cupboard. If you add chopped, cooked potatoes to an omelette you can cook a Spanish omelette, also called a frittata, which makes it a little more substantial thanks to the extra carbohydrates. It is a good idea to have all your ingredients ready before you start to cook your omelette as it is really very quick to make. If you want to add any cooked ingredients that are not cooked already – such as fried onions, peppers or chorizo – cook them in a frying pan with a little oil first. Season them well and add some chilli flakes if you like a little heat. If you are using leftovers in your omelette – such as pieces of roasted meat, roasted vegetables or prawns – make sure they are roughly chopped if needed and at room temperature. 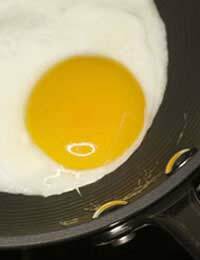 If you add cold ingredients into your egg mixture later on it will overcook as you get the meat up to a hot enough temperature. Remember that recooked meat needs to be piping hot to ensure it is free from any bugs. You can always cook it first, as above. You will need to break your eggs into a large bowl. Make sure your eggs are fresh and ideally at room temperature. Whisk them with a fork or balloon whisk until they are light and fluffy, some chefs recommend a couple of drops of water or milk to lighten the mix, but this is only personal preference. Season your eggs well with salt and freshly ground black pepper. You will need two or three eggs for a one person omelette, with one or two extra eggs per person, depending on appetites. It can also be more stylish to cook an individual two or three egg omelette per person, rather than cutting up a larger omelette. Place a medium sized frying pan onto a medium heat and put in a decent knob of butter or a dash of olive oil. Swirl it around the pan and pour in your egg mixture. Allow the egg to settle in the pan for about thirty seconds and then, using a spatula, gently draw a little bit of the cooked mixture away from the edge of the pan, tipping the pan slightly to allow the uncooked egg from the centre to run into the space. After about one minute, the egg will be nearly cooked. At this point you need to add in your extra ingredients. A plain cheese omelette is delicious – plenty of grated cheddar or emmenthal is ideal. If you like your omelette barely set, you can serve it as it is. If you prefer your omelette to be a bit more ‘puffy’, like a soufflé, you can put the pan under a hot grill to cook the top – although be very careful with the handle of your frying pan as it will get very hot.